The Twisp ARTscapes Project which launched on July 31st continues to thrive at 213 Glover Street in Twisp. Join Jessica Dietz daCosta this Saturday, June 7 from 4-8pm during the Twisp Art Walk to peruse her latest creations, hear about her vision and view the 213 Glover Street Property in Twisp (which is up for sale). 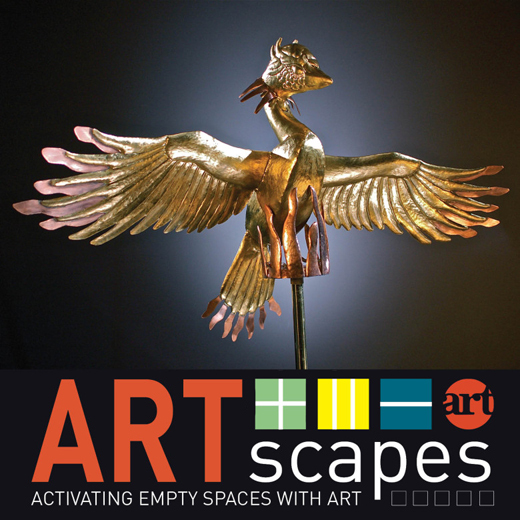 ARTscapes/TWISP is a part of the ARTscapes project featured in Okanogan County (another was the Main Street Project in downtown Omak which recently announced its success in selling the property). Facilitated by METHOW ARTS ALLIANCE the project is designed to activate empty commercial storefronts and vacant space in Okanogan County. The initiative makes no-and low-cost temporary space, training, and technical assistance available to artists, creative entrepreneurs, organizations, and community groups in order to nurture successful projects that transform communities in Okanogan County into stronger, more active towns and cities. A major goal is to transform empty storefronts into attractive spaces that draw more people to the area, along with potential buyers who may see new possibilities in the once-empty building. The Omak Project was recently featured on the front page of the Wenatchee World. Click here to read. The Twisp Project brings more foot traffic into downtown and offers more exposure to local artists. The property, situated between downtown businesses and TwispWorks connects residents and visitors with locally made artwork and encourages them to walk around the downtown corridor. Property owner Lawrence Hooper has generously committed to donate the space free of charge for three – six months as an art studio/exhibit space to Methow Arts Alliance, or until the property sells. (CLICK HERE to view the 213 Glover Street Property). Hooper learned about the ARTscapes project from realtor Kathy Goldberg of Coldwell Banker who is working with Methow Arts to connect potential commercial properties with ARTscapes projects. Methow Arts applauds the commitment of both Lawrence Hooper and Kathy Goldberg in understanding the important link between ART and BUSINESS! The project is modeled after successful projects in Seattle and Tacoma which have had unprecedented success in transforming and revitalizing vacant space with innovative artistic projects. Learn more HERE for Storefronts Seattle and HERE for Tacoma’s Space Works. The Glover Street Property which is zoned for both business and residential, offers ample space for Jessica Dietz daCosta to create, display and hold demonstrations of her copperwork. Dietz will hold regular hours at the property. She will hold artist demonstrations and exhibit her work in the space with regular “garden art displays” to show off her popular copper weathervanes. Look for signage with hours and information in front of the property or visit her website on MethowValleyArts.org for more information. After 15 years of copper and weathervane artistry, Jessica’s signature fantasy-themed art continues to capture the attention of collectors nationwide. Jessica finds joy in working with this radiant copper metal and the process of freehand cutting, forming, and detailing to bring out its natural characteristics of warmth and light. 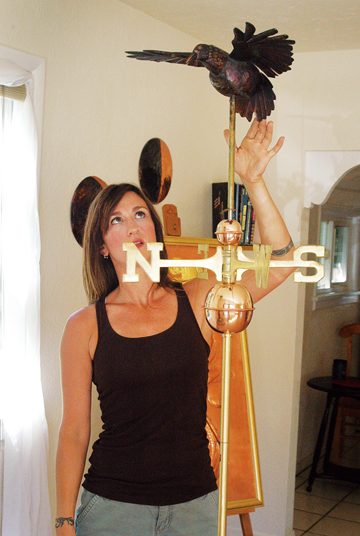 She designs and creates weather vanes for homes and businesses throughout the U.S. and sells her fine art through local and regional art galleries. Jessica stays current on innovation and collaboration within the metal sculpting community and teaches copper-work classes locally. Jessica became an artist and lover of nature at a young age. Her imagination along with her ongoing exploration of the natural world feeds her inspiration for the artwork she creates. Jessica learned the art of copper weathervanes by apprenticing in New England in the mid-1990’s. 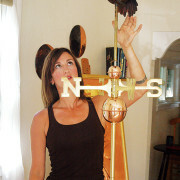 Her passion for researching, sketching and building each piece of her own sculptural copper art has remained constant. CONTACT: Amanda L. Jackson, Executive Director, Methow Arts Alliance, Amanda@MethowArtsAlliance.org, 509.997.4004; LOCATION: 213 Glover Street, Twisp, Wa; MORE INFORMATION: MethowArts.org. It is generously sponsored by: the Icicle Fund, the Community Foundation of North Central Washington, Butler Foundation, National Endowment for the Arts, ArtsWA and many more.